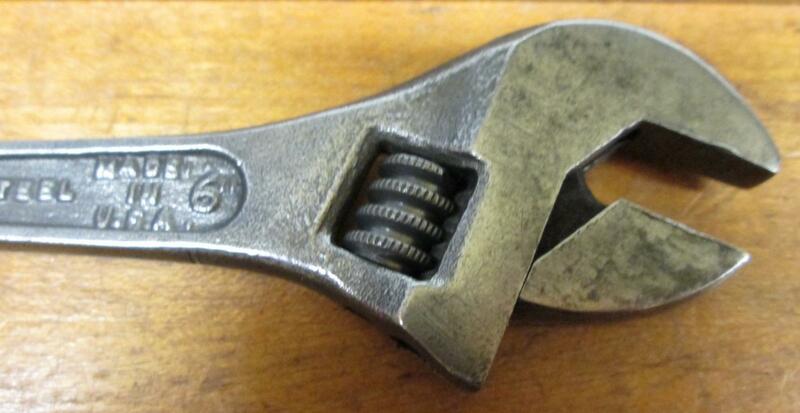 This is a nice clean, used, antique double ended adjustable wrench marked "4 IN. DIAMOND CALK HORSESHOE CO. 6 IN. DULUTH MINN DIAMALLOY TOOL-STEEL MADE IN U.S.A." in raised cast lettering on the handle. This wrench is 6.2" long, and has the smallest size 4" jaw type on one end, and the 6" jaw type on the opposite. There is very minor wear noted around the jaws, not bad, in very good, useable condition, no rust, with very good jaw alignment, some minor edge dings. We note that the knurls are both like new. A nice clean vintage wrench from the 1920's-40's era! Diamond Horseshoe Co. and Diamond Calk and Horseshoe Co. are one in the same. The design is so close to that of the Crescent Tool Co., one wonders if the two companies were connected in some way. Yet we find no evidence of this in any records regarding these quality tool making companies. We can't find any history about Diamond Horseshoe or Diamond Calk after early 1950. This is the first one of these that I have had for sale in this size in several years, quite rare! Items Similar To "Diamond Calk Horseshoe Double Ended Adjustable Wrench"